Wondering if hammock camping with your dog is a good idea? There’s nothing better than hammock camping with your loving companion when it’s done the right way. I say that because there are many things people forget to consider before taking their dog hammock camping. But you have an advantage. After reading this complete guide, you’ll have a crystal clear idea of what to expect when taking your dog hammock camping. As a bonus for this post, I prepared an infographic for you to enjoy. I like making them, and I think they fit pretty good with the post. First Things First: Is Your Dog Fit for Hammock Camping? I know this may seem obvious, but it’s something many people may overlook. Swarmed with the thoughts of a happy camping trip with their dog, they forget if their dog is fit to go camping with them. Determining if your dog is “fit” for camping will come down to several factors. Keep in mind, these are subjective depending on how intense of a trip you are planning. One of the most important factors is the physical fitness of your dog. Give yourself an honest evaluation of your dog’s fitness based on their breed and everyday activity levels. If your dog is a breed who’s naturally inclined to run many miles a day such as a German shorthaired pointer, then you’ll have less to worry about on longer hikes. For dogs who are smaller/older, you may want to stick to less intensive hammock camping trips. Keep the activity to shorter hikes or carry your dog to the campsite if you’re not camping at a sanctioned campground. Smaller/older dogs can be worn out very easily while hiking. Dogs in general don’t have the same endurance levels as humans, let alone smaller and older dogs. When you’re hiking, your dog may not stop when tired either, as their loyalty instinct may cause them to exhaust themselves beyond what is considered healthy just to keep up with you. Sharp rocks and hard objects on the trail can also hurt smaller/older dogs more easily. If your dog isn’t very well-behaved, I would advise you to avoid hammock camping. The last thing you’d want is for your dog to run off from your campsite into the woods chasing after a squirrel. Or even worse, for your dog to run off into someone else’s campsite. Overly aggressive dogs will also have trouble behaving themselves whenever they see any smalls animals or fellow campers. You wouldn’t want another person’s aggressive dog coming at you when hiking or camping. Be considerate and avoid taking your dog hammock camping if they have issues with aggression. How Well Will Your Dog Sleep While Hammock Camping? Plan ahead how well your dog will sleep while hammock camping. I recommend doing a test hammock with your dog at home in your backyard or at the local park. Some dogs will naturally get the hand of hammocking, and love cuddling with you in the hammock. Others may be too large or too scared to get in the hammock with you. This isn’t a problem, as many people hammock camp with their dogs by having them sleep beneath the hammock (more on this later). But, if your dog can’t sleep without being next to you and can’t seem to get the hang of the hammock, it may be wise just to avoid taking them on your next trip. By figuring out how your dog prefers to hammock with you beforehand, you can better prepare for your trip, making it more enjoyable for everyone. P.S. Don’t forget to make sure your dog fits in the hammock with you! For smaller/medium-sized dogs, you can probably get away with single-person hammock. For larger dogs, you may want to get a double-wide hammock that’s meant to sleep two. You’ll definitely want to take a few extra steps to prepare for a hammock camping trip with your dog. If you miss one or two of these, you may end up regretting you didn’t prepare more. Please don’t skip this step. While it may seem harmless enough, I would recommend you make sure your dog has the latest vaccines. 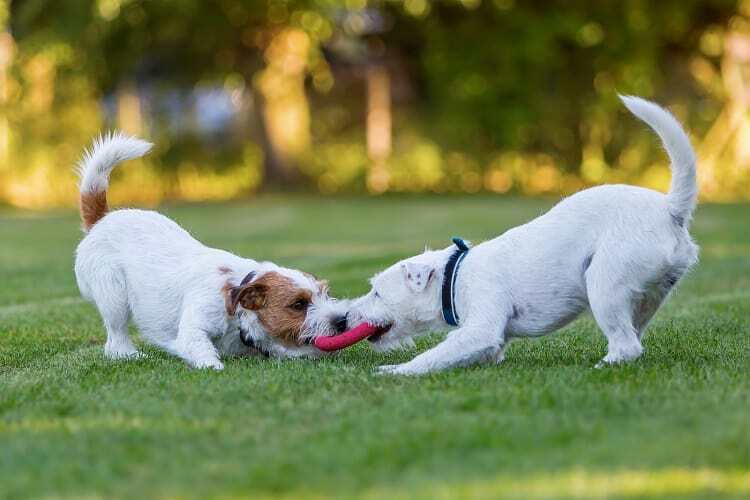 There’s a very large list of diseases your dog can contract, including waterborne illnesses, bacterial infections, and parasites including heartworms from mosquitoes. One of the obvious examples that comes to mind is to groom dogs whose long coats may make them uncomfortable in the summer heat. Even if you don’t go on any long hikes, spending all day outdoors in the heat could make your dog overheat. Especially if they haven’t quite shed their winter coat yet. If you’re planning on sleeping with your dog in your hammock, you’ll want to trim your dog’s nails too. You can either trim your dog’s nails at home or take them to a groomer and have them trim your dog’s nails for you. Lastly, don’t forget to give your dog flea and tick protection. You can talk to your vet for your preferred method, or simply pick up some flea and tick medicine that you apply yourself. Either way, you’ll be doing your dog and yourself a great favor. Ticks and fleas aren’t fun for anybody, especially if you’re sleeping together. What Should You Pack For Hammock Camping With Your Dog? You’ll want to pack a few extras when taking your dog hammock camping. Here’s a list of things I recommend you pack alongside your usual hammock camping gear. This one is obvious, but absolutely critical. Your dog will need lots of water when they’re active outdoors all day long. I found there’s no hard and fast rule for the amount of water to pack, but it’s best to be generous. I’d recommend a liter of water per day for each large dog you plan to take hammock camping. This should be enough to keep them hydrated for a fun packed day that includes few miles worth of hiking in hot weather. Smaller dogs can obviously get away with less, but remember to be generous with the amount you pack. Better safe than sorry. A dog that prefers to sleep in the hammock with you won’t need as much gear as a dog who prefers the ground. You should be able to get away with your normal hammock camping essentials, such as a bug net, rain cover, quilts and sleeping pad. If you plan on hammock camping in the winter, you’ll also want to bring extra insulation. If you found that your pooch would prefer to sleep on the ground beneath your hammock, you’ll want some extra items to make their night easier. Here’s a list of extra gear to pack for your dog when they sleep beneath your hammock. That’s quite the list of extras, but remember that you’ll want them to be as comfortable as you are in your hammock. A good way to cut down on the items needed is to get your dog their own single person tent. This will cut the need to bring everything except for a sleeping pad and blankets to keep them warm and comfortable. First and foremost, make sure the campsite allows dogs. If you’re staying at a sanctioned campsite, call ahead of time and make sure they allow dogs at the campsite. Be sure to follow campsite rules regarding leashes and picking up poop. Ideally, you’ll want a flat campsite with cleans grounds free of trash and dangerous debris. I wouldn’t want to worry about my dog stepping on broken glass bottles or sleeping on sloped terrain. While you can get away with camping on a hillside, it will make things more difficult for both of you. If you’re sleeping in a hammock with your dog, sloped terrain can make getting your dog in and out of the hammock more dangerous. It can already be awkward lifting a large dog into a hammock, and sloped terrain only adds to the difficulty. For dogs who prefer sleeping on solid ground, sloped terrain could make their situation more challenging. They can struggle to get comfortable and feel secure. Plus, it adds unnecessary risk of injury while sleeping. Many dogs move around while dreaming, which could cause them to go tumbling down a slope. In short, save both of you a good deal of trouble and scout out a flat campsite for an easier night’s sleep. You might be able to hammock in the toughest weather conditions, but your dog may be less willing. Sure, they could get through the night, but during a rough thunderstorm with heavy downpour, they may not sleep much at all. 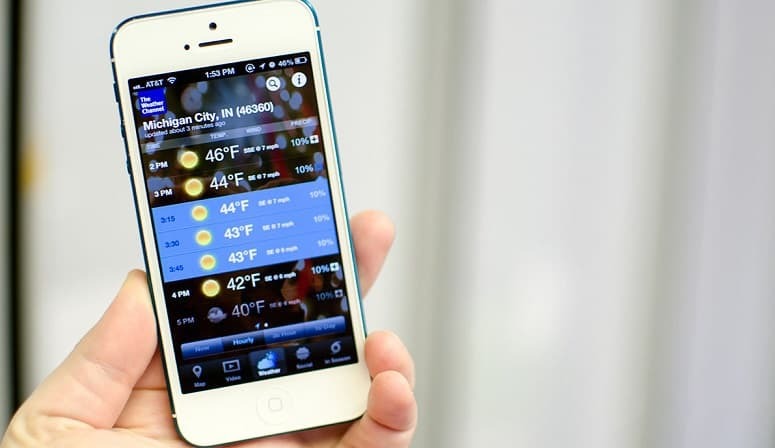 To keep your dog happy, make sure to keep a close eye on the weather beforehand. If you know your dog doesn’t do well with thunder and the weather forecast has a chance of thunderstorms, it may be wise to delay your trip until it clears up. Use your best judgment here call it appropriately. You know your dog better than anyone else. If you know your dog will have no trouble sleeping in a hammock during a rainstorm, then camp away. When you arrive at the campsite, look around for any hazards to your dog. Some things to look out for are broken glass, garbage, large holes or dead trees. If you’re staying at a sanctioned campsite, be sure to report any dangers to administration. When you go to set up your camping hammock, inspect the trees you intend to hang from carefully. You’ll want to make sure you aren’t hanging your hammock from dead trees that could collapse under your weight. Also inspect the trees and environment around your hammock. Keep an eye out for any dead trees or debris that could fall and injure you. Once you’ve selected your hammock spot, it’s time to hang your hammock. I’m assuming this isn’t your first time hammocking, so just set up your hammock how you normally would. 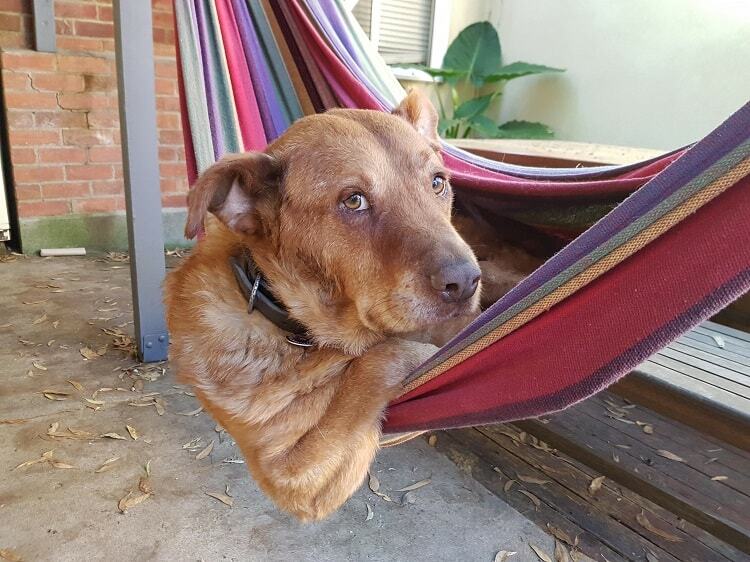 You can optionally hang it slightly lower than usual if you have a big dog you need to load into the hammock. If this is your first time hammocking, setting up your hammock for the first time isn’t too hard. If you plan on sleeping with your dog in the hammock, then you won’t need to set up a bed below the hammock for your dog. If you don’t plan on sleeping with your dog in the hammock, then you’ll need to set up your dog’s bed beneath your hammock. Depending on their sleeping setup, you’ll approach this part different from others. 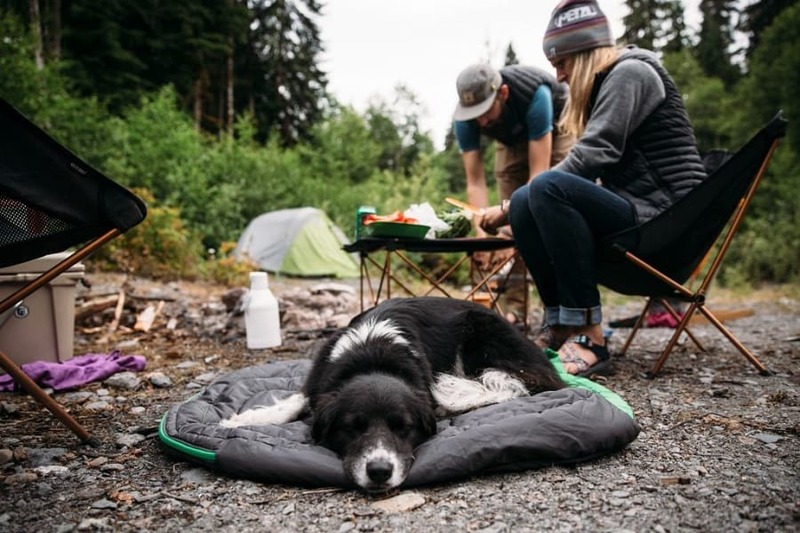 If you chose to give your dog their own tent, then all you’ll need to do is lay down a tarp, setup the tent and throw in some blankets for your canine. 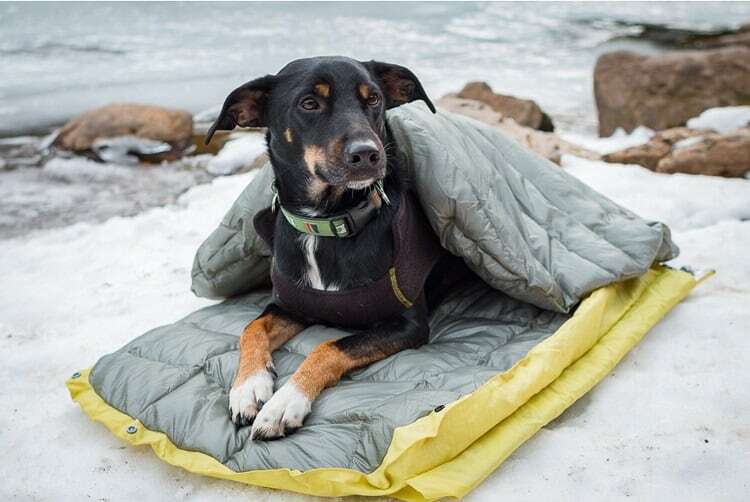 For a sleeping pad or dog bed, you’ll want to place down a tarp, then their bed, followed by blankets and quilts. You can also drape a tarp down from your hammock to protect them from the wind. I’d also recommend at a minimum you drape a mosquito net beneath your hammock so your dog doesn’t get eaten up. With all this done, your dog should have their own little tarp tent beneath your hammock. Protected from rain, wind and mosquitoes, they’ll sleep easy through the night. Depending on the campsite, you may also be required to tether them to the tree. If you suspect your dog may wander off in the night, you’ll want to tether them anyways. A good way to tether them is to wrap a leash around the tree and connect it to their collar or harness as you normally would. As you can see, hammock camping with a dog isn’t too hard. Planning ahead is 90% of the battle. Once you make it to the campsite, it’s smooth sailing given you’ve properly prepared. If you know someone who would like to hammock camp with their dog, share this article with them. They may end up finding an activity they can enjoy with their pooch for the rest of their lives. Thank you for reading my guide on how to hammock camp with a dog. Let me know what you think in the comments below!